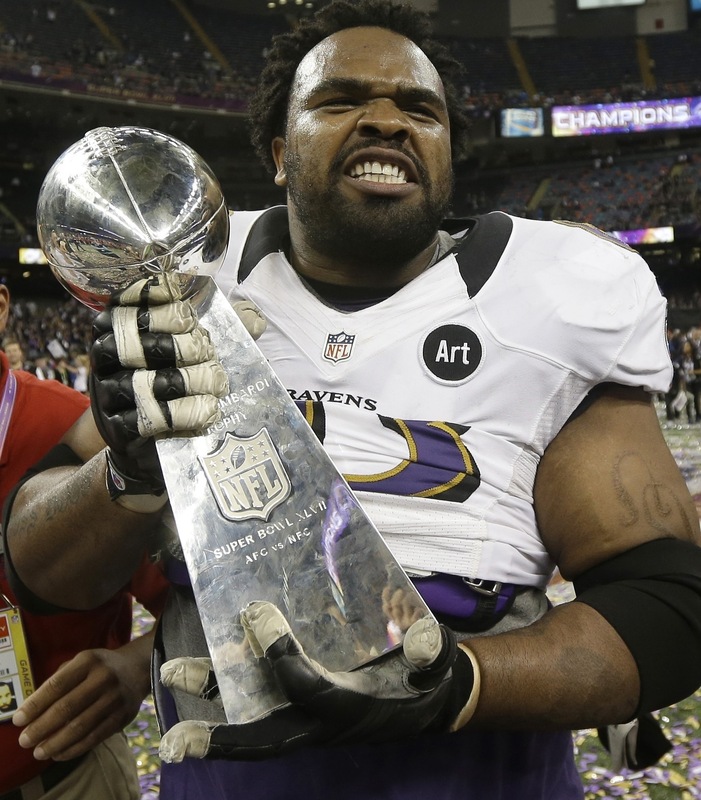 Baltimore's Bobbie Williams with the Vince Lombardi Trophy. &apos;FOOTBALL&apos;S DEATH SPIRAL.&apos; Writing in Salon, Andrew O&apos;Hehir says "the writing is on the wall for this bloated, behemoth sport." * Obama: "We want to make sure that after people play the game they&apos;re going to be okay." WHAT TIME DID THE SUPER BOWL START? You can ridicule, as The Atlantic does expertly here, all the websites that tried to win your clicks by answering that simple question. But, as NYU journalism prof Jay Rosen says, "Anyone who doesn’t want to know what the numbers say shouldn’t be trusted with editorial decisions." * Second graders proofread NFL players&apos; tweets. WELL, HE CAN NAME THREE OF THESE. Texas Gov. Rick Perry, an Eagle Scout and former presidential candidate, offers reasons the Boy Scouts of America shouldn&apos;t admit gays, including what he describes as the organization&apos;s everyday advocacy of "tolerance and diversity," its "historic position of keeping the Scouts strongly supportive of ... values," and the importance of not letting "popular culture impact 100 years of their standards." * Obama on "Scouting Sunday": Scouts should accept gays and lesbians. * Chicago-area minister: Scouting, "which seeks the support of churches like ours… stands against the very kind of welcome that we extend to those folks." &apos;THAT&apos;S RIDICULOUS, AND YOU KNOW IT, SIR.&apos; Fox News host Chris Wallace didn&apos;t provide a friendly forum for National Rifle Association chief Wayne LaPierre. * Nobel winner Paul Krugman calls NRA "an insane organization." * Acclaimed retired Navy SEAL sniper shot and killed by fellow ex-soldier. &apos;A BIZARRE POLITICAL TWIST.&apos; Calling the Illinois race to replace Jesse Jackson Jr. in the House a "proxy battle in the war for sane gun policy," the national liberal website Daily Kos is backing candidate Robin Kelly. * Candidate Kelly challenging others to release their NRA questionnnaires. * Photos show Obama, other U.S. presidents firing guns. * Amazon.com listing for toy drone airplane draws dozens of satiric reviews, like this one: "My son ... spent countless, blissful hours simulating massacres of weddings, funerals, and other family gatherings of brown skinned foreigners!" ON TWITTER? CHANGE YOUR PASSWORD. That&apos;s one of the simplest precautions to take after revelation of a security break. * Android "malware" app has "most extensive feature set" security firm&apos;s seen -- including power to infect a computer, take control of its microphone, record you without your permission, and send the recordings to the attacker. * Typing "File:///" will crash apps under Apple&apos;s latest Macintosh operating system. NATION SHAKEN. The man who invented the Etch A Sketch is dead. * Song that helped get this edition out the door: Pete Yorn, "Alive."